Instant smiles. It’s almost a whiteout inside Reynolds Elementary School. Hazel, the therapy dog, is in the hallway, and happiness abounds. 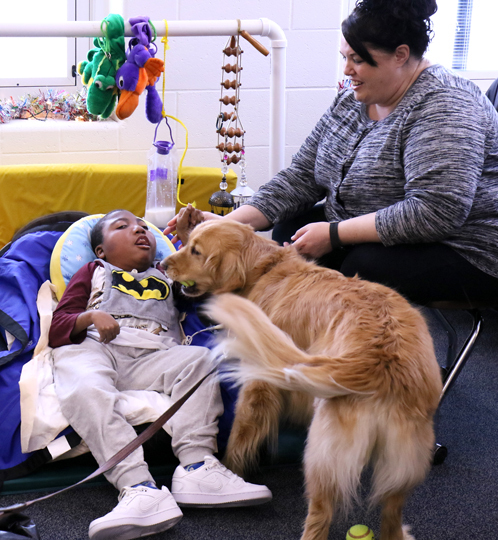 Marquis, a student at Reynolds Elementary School, petted Hazel, a therapy dog, as owner Dr. Dawn Sandt watched. It’s just another day for the sweet, outgoing golden retriever and her owner, Dr. Dawn Sandt, associate professor in the Department of Early Childhood, Higher Education and Special Education. “Hazel!” yelled a boy in the preschool special-needs classroom, alerting all to the visitors. 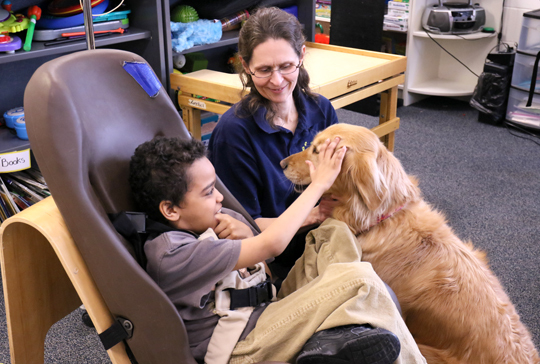 “Do you want to go see Hazel?” teacher Bridget Harding asked as the children walked and crawled toward the therapy dog that laid down and was content literally being the center of attention. Ricardo shook his head no, beaming as he ran his hand over Hazel’s soft coat. Sandt knelt next to Hazel; she held the dog’s leash and monitored all interactions. Dr. Dawn Sandt, right, and Reynolds Elementary School teacher Leah Richter, center, watched as Hazel visited Ireland. Then it was on to a classroom to see medically fragile students. Hazel walked up to teacher Leah Richter. After soaking up compliments and a few pats, Hazel melted into the floor and flipped over, and Richter obliged with a belly rub. Watching it all from her wheelchair was Ireland, who could not stop smiling. “You love it when Hazel and Dawn come!” Richter said to Ireland. With encouragement from Sandt, Hazel put her paws on the edge of Ireland’s chair — and the girl grinned. Then it was time to see the younger medically fragile students. Marquis, a student seated on the floor, clapped and started humming when Hazel trotted into the room. Paraprofessional Zippy Keith helped Lee grasp a tennis ball to give to Hazel during a recent visit to Reynolds Elementary School. “We have a gift! We have doggy tennis balls for Hazel,” paraprofessional Zippy Keith announced. The children took turns tossing the ball for the canine. For the first time, Lee picked up a ball and handed it to Hazel. Meanwhile, teacher Liz Bishop told Tessa she needed to complete her assignment so she could see Hazel. “We’re all so happy to see Hazel. We enjoy her,” Keith said as the kids petted the retriever. “Aren’t you glad you got your work done?” Bishop asked Tessa, who lit up when Hazel gently stood up on the side of her wheelchair. “Thank you for the visit,” paraprofessional Melissa Falkenberg said as Sandt and Hazel left. “The best part of making the rounds with Hazel is seeing students progress toward their individualized goals and realizing Hazel did contribute to that progress in some way,” Sandt said. 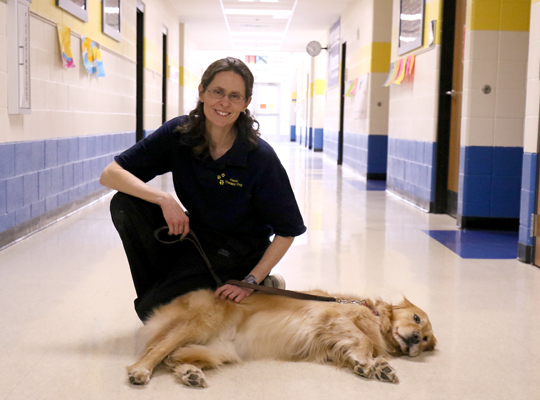 Paraprofessional Melissa Falkenberg smiled as Hazel took her tennis ball to Dylan. 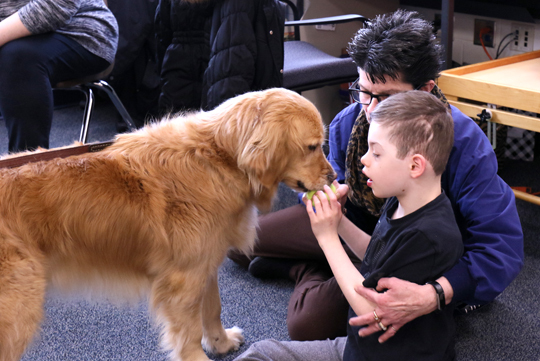 The therapy dog regularly visits Reynolds Elementary School. Sandt and Hazel have been visiting students at Reynolds Elementary for two years. “We started in the classrooms where students were medically fragile. Hazel does well in those classrooms because she is willing to initiate contact with the children,” Sandt said. “The children have opportunities to track her with their eyes, reach out to pet her, and grasp and drop a ball for her to retrieve. Indeed, the pretty pooch that will turn 4 in August does just that. Tessa communicated with her assistive device so she could see Hazel, and Lee had a breakthrough by picking up a tennis ball. “The teachers, nurses and I thought that was pretty extraordinary for [Lee], who is medically fragile and also has sensory issues. The nurse said he had never shown that type of initiative before,” Sandt said. The duo also visits McTigue Elementary School. Dr. Dawn Sandt said Hazel would go home and sleep after visiting children at Reynolds Elementary School. Dr. Virginia Keil, interim dean of the Judith Herb College of Education, said Sandt and Hazel are an example of how faculty collaborate with Toledo Public Schools. “Dawn is deeply committed to working with our school partners to provide support for medically fragile children with special needs along with the educators in these classrooms,” Keil said. 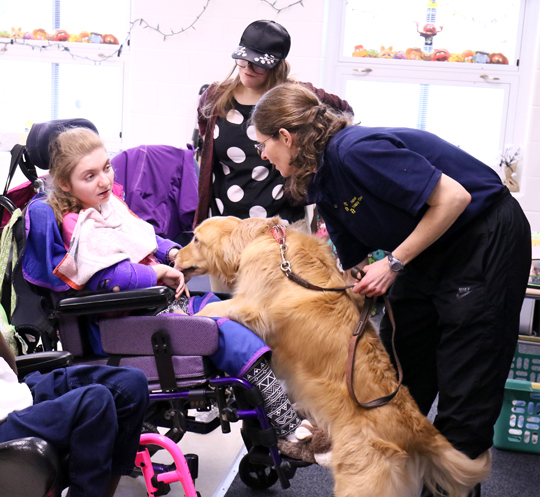 “Therapy dogs like Hazel are desperately needed to provide affection, comfort and love, which can help to improve the lives of the children they have visited. To that end, Sandt is working with Dr. Janet Hoy-Gerlach, associate professor in the UT Social Work Program and author of the book, “Human-Animal Interactions: A Social Work Guide.” They have applied for a grant to explore how therapy dogs can be used in applied behavior analysis interventions for students with disabilities. Sandt has another golden retriever, Rusty. The 2-year-old is training to be a therapy dog. “I can’t imagine doing anything else with the time I have on this earth,” she said as she gave Hazel a treat. This entry was posted on Thursday, April 5th, 2018 at 3:43 am and is filed under Features, UToday, — Judith Herb College of Education .